The risks for developing drug addiction may be influenced by biological, environmental and developmental factors. Addiction is a chronic, typically relapsing, brain disease that affects the reward structure of the brain, causing compulsive drug use and seeking behaviors, despite suffering the negative consequences associated with addiction. Drug addiction is considered a brain disease because, over time and abuse, it changes the function and structure of the brain. While it is a fact that when a person uses drugs initially, it is a choice to do so, over time the changes that occur in the brain due to repeated use can actually impair the person’s self-control and reduce the ability to make good decisions, while simultaneously creating an overwhelming impulse to take more drugs. 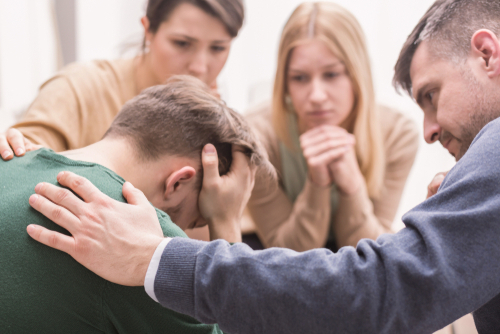 Overcoming addiction requires therapeutic intervention and ongoing supportfrom an addiction specialist. Addictive substances and behaviors can actually change certain areas of the brain associated with pleasure, motivation and memory. Continued use of these substances or behaviors will increase the risk of becoming addicted. Drug addiction occurs because the chemicals in drugs disrupt the brain’s communication system and the way that nerve cells receive, send and process information. This disruption typically happens in one of two ways, or a combination of both – the drugs mimic the natural chemical messengers of the brain, or they overstimulate the reward center of the brain. Some drugs, like opioid painkillers and heroin, have a structure that is similar to the brain’s chemical messengers or neurotransmitters, which are produced naturally by the brain. Due to the similarity, these types of drugs “trick” the brain’s receptors and cause the nerve cells to send abnormal messages. Drugs that are stimulants, like methamphetamines and cocaine, can cause the brain to release large, sometimes massive, amounts of its natural neurotransmitters, or they can stop the normal recycling of the chemicals, which is necessary to interrupt the signal between neurons. Stopping that process causes an amplified message that wreaks havoc on normal communication patterns. Almost all drugs abused affect the brain’s reward system by flooding it with dopamine. Dopamine is the neurotransmitter that helps control emotion, movement, motivation, and pleasure feelings. When this system is overstimulated, it produces euphoric feelings in response to the drug. As the drug use continues, the brain recalibrates itself to the floods of dopamine by producing less of the neurotransmitter or reducing dopamine receptors. That means that the person will have to continue to abuse the drug to bring the dopamine function back to “normal,” or he or she will have to increase drug use to attempt to achieve the same euphoric high. Why Do Some People Become Addicted To Drugs, While Others Don’t? There isn’t one specific thing that can predict whether a person will become addicted to drugs. There are some common risk factors though, that may increase the chances that someone will become an addict. The risks for developing drug addiction may be influenced by biological, environmental and developmental factors. The greater the number of risk factors a person has, the higher the chances are that if they begin taking drugs, they will become addicted. Biological – There is a genetic component to drug addiction. People who are born with certain genes may have a higher level of risk of becoming addicted to drugs. That, in combination with environmental factors, typically makes up about half of their vulnerability to addiction. Also, biological factors like ethnicity, gender, and the presence of mental disorders may influence their risks. Environmental – Many different environmental factors contribute to a person’s risk of becoming addicted to drugs. Their socioeconomic background, family and friend influences, and quality of life all play a part. Past trauma, sexual or physical abuse, peer pressure, stress, and parental involvement can also significantly add to a person’s risk of drug addiction. Developmental – Where a person is in their life, developmentally, from an age and emotional maturity perspective, can greatly affect his or her chances of drug addiction. While anyone, at any age, can become addicted, people who begin using drugs during adolescence or younger, have a much higher propensity to addiction later in life. Sometimes habits are mistaken for addiction, but there is actually a major difference. Habits may seem automatic, but they are actually self-controlled and performed by a person’s choices. The psychological and neurological changes that it takes to break a habit are different from the changes it takes to overcome addiction. Even though drug addiction is a brain disease, it is preventable. Studies show that programs that are dedicated to the prevention of drug use in the first place, involving family, schools, communities, and the media, are effective in reducing drug abuse and addiction. For those who are already in the throes of drug addiction, treatment is essential to making the right changes and discovering a new life of recovery. With the treatment offered at Life of Purpose, and an ongoing recovery program, you can get and stay clean and live a fulfilling and happy life. In treatment, those suffering from drug addiction are taught new coping skills so that when feelings of frustration and pain do come up, they are prepared to deal with them without returning to drug use. Follow Life of Purpose on Facebook for more information.